This middle-school children’s book is a tender, funny, and honest look at the experience of middle-school boys, faced with the illness of their favorite teacher. It puts us into the hearts and minds of three good friends, as they reveal secrets of their lives and feelings to themselves, the reader, and each other. While it is not a maudlin or mushy children’s book, suffice it to say that each boy is grappling with serious home difficulties. Perhaps they have been exaggerated to make a good book, but they probably come close to truth for a good percentage of today’s children. The book covers a wide range of emotions from grief to great humor. 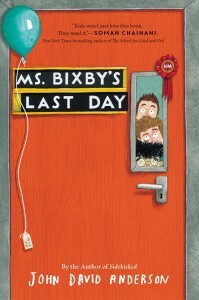 The teacher, Ms. Bixby, is the kind of extraordinary, honest, and competent teacher that all of us who teach would love to be, and the kind that we’d love our children to have at least once in their school life. Her attention to the lives of the children, and not just their test scores, brings us to the core of the story – how important one caring person can be in the life of a student. If for no other reason than that, this is an important children’s book. I would hope that perhaps this children’s book could be read as a family experience, because so much of the distress for the kids in the book comes from challenges at home. I am also delighted that once again, we have a quality, sensitive, middle-school children’s book that has boys as the main characters, not common for many books. This one will definitely touch the hearts and minds of many people.